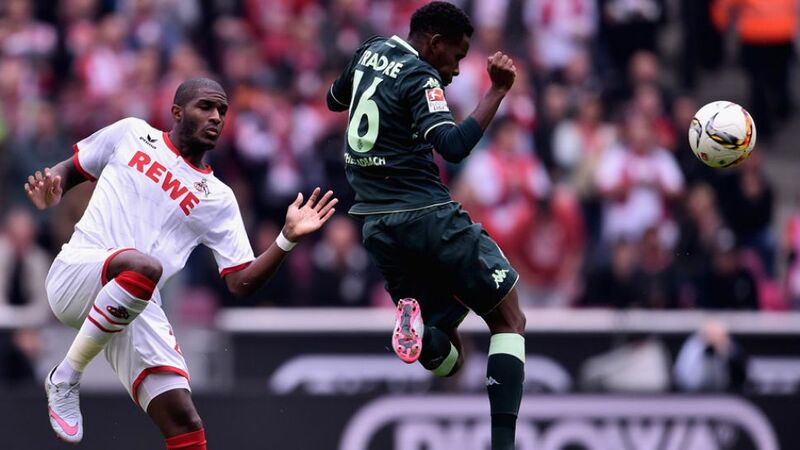 Cologne - Anthony Modeste scored the winner as 1. FC Köln inflicted a fifth successive Bundesliga defeat of the season on rock-bottom Borussia Mönchengladbach in Saturday’s Rhine derby. Looking to arrest a five-match losing run, bottom club Gladbach made a tentative start. Modeste robbed Granit Xhaka of possession and released Marcel Risse, but the Köln winger skied over when through on goal. Gladbach goalkeeper Yann Sommer foiled Leonardo Bittencourt following an incisive attacking move involving Jonas Hector and Matthias Lehmann, before Yuya Osako saw a close-range effort on the turn deflected over. Gladbach’s Andreas Christensen had done a brilliant job at keeping Modeste quiet, but the young Dane was helpless to prevent the big Frenchman flicking home a pin-point Bittencourt cross to give the home side a deserved 64th-minute lead. The Foals’ best chance of another demoralising team display fell to veteran defender Roel Brouwers, who could only find the gloves of Timo Horn from an offside position. Köln fans would have been forgiven for having their doubts after Anthony Ujah left the club for SV Werder Bremen in the summer, but the Billy Goats faithful have a new goalscoring hero in the form of Modeste. Leaping like a salmon, the 27-year-old took his one chance with aplomb to extend his scoring record to seven goals in six competitive outings since joining the Rhineland outfit from TSG 1899 Hoffenheim. Gladbach’s defensive shortcomings have been well documented, but their lack of punch in attack will concern head coach Lucien Favre. Whether or not it is a confidence issue, Josip Drmic and Raffael were simply starved of opportunities in the final third. Gladbach’s Mahmoud Dahoud made his first ever start in all competitions.The Foals went in at half time with a clean sheet for the first time this season.Borussia have now lost their last six Bundesliga matches on the spin dating back to last May.